How Do Americans View the World? The Obama administration has a unique opportunity to redefine the U.S.-Russian strategic relationship by cooperating with Moscow on missile defense. A missile defense system that does not jeopardize the current strategic balance will help erase lingering Cold War animosity and promote stability in the broader Euro-Atlantic region. And progress on missile defense technology sharing, data exchanges, and joint staff exercises could pave the way for negotiations on long-stalled issues like nonstrategic nuclear weapons. Missile defense presents an urgent and unprecedented opportunity for U.S. President Barack Obama to begin putting a definitive end to the troubling legacy of distrust that has plagued the U.S.-Russian relationship since the end of the Cold War. Two decades of post–Cold War diplomacy and U.S.-Russian engagement have certainly eased tensions between the two nations, reduced their nuclear arsenals, and reshaped force postures in Europe. But dangers to security and prosperity persist, and the normalization of relations between the two states and their allies remains fragile. The United States and Russia rely on the previous century’s military doctrines of mutually assured destruction and an array of strategic nuclear arms maintained on high alert. Obama and the leadership in the Kremlin must move forward on missile defense cooperation. The relationship needs a solid foundation and a commitment to enhance mutual security. Successful cooperation on missile defense would go a long way toward that goal. But divisions over the issue continue to poison relations, breed suspicion, and stand in the way of possible future progress on reducing strategic arms. If the current situation persists, greatly empowering opponents of broader normalization and stability in U.S.-Russian ties, the Euro-Atlantic community and global peace and prosperity will suffer. For the sake of the security of the Russian and American people as well as their allies and the world as a whole, Obama and the leadership in the Kremlin must move forward on missile defense cooperation. Progress hinges on the successful development of a formula for cooperation on missile defense between the North Atlantic Treaty Organization (NATO) and Russia. The United States and its NATO allies have already decided to begin deploying missile defenses in Europe to defend against attacks from third parties, insisting that the system cannot threaten Russia’s strategic deterrent. Russia has been invited to participate in the program by lending assets to it without playing a controlling role. Moscow declined and expressed its concern about some parts of the plan. In particular, it is wary about the advanced stages of the NATO program, which provide for the deployment of missile interceptors (SM-3 Block IIB) that the Russians claim can shoot down some of Russia’s own intercontinental ballistic missiles and not just yet-to-be-built Iranian missiles the system is officially designed to oppose. Moscow has countered with a proposal for a joint dual-key missile defense system in Europe in which Russia and NATO would share control of interceptor-launch decisions. It has also proposed concluding a legally binding agreement with the United States that guarantees NATO’s Europe-based missile defenses will not have the capacity to target the Russian strategic arsenal. This Russian proposal, however, is unacceptable to the United States and will remain so because in the post–Cold War era, the United States rejects limitations on its missile defenses as a matter of principle. Ultimately, the two must agree on a system that effectively defends against an Iranian missile strike while addressing Moscow’s concerns about not jeopardizing the credibility of Russia’s nuclear deterrent or compromising the principles of sovereign control over national assets. Furthermore, as the United States and Russia proceed toward cooperation on missile defense, both will need to address the question of China’s attitude toward such cooperation. At a minimum, Washington and Moscow should make it crystal clear to Beijing that their collaborative effort is not aimed at China and does not degrade China’s deterrent. Verbal assurances on this score will not be enough. If these hurdles can be overcome, such cooperation would be truly game-changing. It could transform U.S.-Russian strategic relations from their present semiadversarial, wary state into a more collaborative formula for the future. Much of the groundwork for such cooperation is in place. During discussions held between 2010 and 2012, both Russia and NATO explored in detail each other’s views and positions. Yet, the two sides have lacked the means and the will to reconcile their differences. 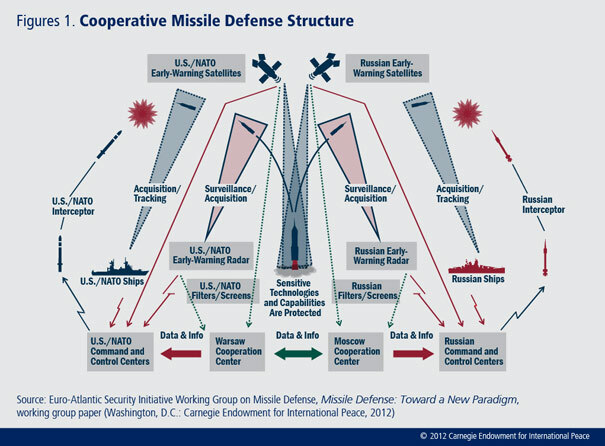 A workable and feasible approach to cooperative missile defense does exist. It is based on a number of principles that form the foundation for U.S./NATO-Russian cooperation on missile defense in Europe. One building block is the joint goal of addressing the evolving third-country threat from medium- and intermediate-range ballistic missiles banned under the 1987 U.S.-Soviet Intermediate-Range Nuclear Forces Treaty. It is further presumed that each side seeks to enhance the effectiveness of its response to this threat through mutual cooperative efforts. And finally, it is taken as a given that Washington and Moscow intend to use cooperation on missile defense to develop gradually a nonadversarial, collaborative strategic relationship and thus create a Euro-Atlantic security community, comprising North America, Europe, and Russia. These principles and a suggested cooperative structure based on them were developed by the high-level international commission convened by the Carnegie Endowment for International Peace under the Euro-Atlantic Security Initiative (EASI). A cooperative arrangement built on such a foundation would not immediately result in a joint missile defense system. That outcome is unrealistic at this point. Instead, cooperation would be based on the interaction between national and alliance missile defense systems, with each sovereign partner remaining fully responsible for its own security and defense. Appropriate technology sharing would make U.S. and Russian missile defense systems technologically and operationally compatible. In essence, creating such centers would be the same as implementing the 2000 U.S.-Russian agreement on early-warning data exchanges, but this iteration would involve more intense interaction and a higher level of integration between the national security establishments. The focus of the Moscow and NATO centers would be integrating data and forming a comprehensive picture of potential dangers as well as coordinating responses to real missile threats. For this purpose, joint U.S.-Russian command-staff exercises on ballistic missile defense, which were resumed in March 2012, should be expanded in scope to include defense against medium- and intermediate-range missiles. The essential and most sensitive part of any arrangement on cooperative missile defenses in Europe is ensuring that as both the United States and Russia deploy their interceptors, these deployments do not impair the strategic balance existing between the two countries’ nuclear-weapons arsenals. The idea is, in a nutshell, to build effective defenses against Iranian missiles without provoking Russia to consider those defenses as a threat to itself and to respond by raising its deterrence capability vis-à-vis the United States. There is more than ample reason for President Obama to pursue U.S.-Russian cooperation on missile defense. Such cooperation both would help protect Europe from an Iranian missile strike and would over time lead to a fundamental transformation of the two countries’ strategic relations. Unlike traditional arms control, this active defense collaboration is no longer simply about managing an adversarial relationship. It is a practical step toward a qualitatively new kind of collaborative partnership. U.S.-Russian cooperation on missile defense would help protect Europe from an Iranian missile strike and would over time lead to a fundamental transformation of the two countries’ strategic relations. Moreover, deepening U.S.-Russian understanding of each other’s national security strategy and military doctrines through cooperation on missile defense would help overcome the legacy of suspicion and distrust rooted in Cold War strategies and doctrines. It is simply impossible, over the long term, to cooperate closely to address missile threats from third parties while keeping vast nuclear-weapons arsenals on constant alert pointed at each other. Cooperation on missile defense would be truly strategic and equal—unlike the joint peacekeeping experience in the Balkans in the 1990s, for instance, which was dismissed at the time as both peripheral and hierarchical (and resented by the Russians as such). Success on missile defense can also bring progress in critical areas and holds the promise of ushering in a degree of stability during a period of great global uncertainty and fluidity. It would unblock the way forward in a number of areas important to the United States and its NATO allies. In an improved atmosphere of collaboration between the United States, NATO, and Russia, negotiations on nonstrategic nuclear weapons and on strategic non-nuclear arms, which have been stalled for years, could at last become possible and productive. This, in turn, would open the way to new U.S.-Russian agreements on further reductions of the two countries’ strategic nuclear-weapons arsenals. Success on missile defense can bring progress in critical areas and holds the promise of ushering in a degree of stability during a period of great global uncertainty and fluidity. The Europeans, probably more concerned about the adverse impact of strained U.S.-Russian relations on their security than about Iranian missiles, would be reassured, and the Atlantic relationship would be enhanced by U.S.-Russia cooperation. The broader Euro-Atlantic area would move closer to becoming a security community—a zone of stable peace where interstate conflicts are resolved without the use of force. As a result, strategic stability across the world would be substantially strengthened. Forward movement on missile defense would also open additional paths for constructive engagement and dialogue about the future of both nations’ relations with Asia, in particular China. It is time that the United States and Russia use the issue of missile defense, which concerns China, jointly to engage the Chinese in an in-depth trilateral discussion of various aspects of strategic stability. In particular, there is a need to discuss the value of nuclear deterrence and the role of nuclear weapons in national security strategy as well as nuclear doctrines and conceptual models for negotiations on arms control. In the best-case scenario, U.S.-Russian cooperation on missile defense in Europe could lead to greater understanding between the United States and China regarding U.S. missile defense deployments in the Asia-Pacific region. This type of engagement on missile defense will demand political initiative, persistence, and commitment at the highest levels. Without presidential commitment, cooperative missile defense will not happen. The effort to find common ground in this endeavor has eluded each U.S. and Russian administration since the end of the Cold War, including promising efforts in recent years. But, even though recent U.S.-Russian exchanges on missile defense have not produced an agreement, the situation is neither hopeless nor beyond reach. It will be years before the United States begins to deploy the systems that worry the Russians. Washington and Moscow can exploit this window for productive dialogue and forge specific and cooperative arrangements that presume an understanding by both sides that it makes little sense to build defenses against Iran or any other state if the price of that effort is greater instability and uncertainty about security in the very region the missile defenses are designed to protect. For productive relations with Moscow, President Obama and other U.S. leaders will have to find politically viable, effective means to promote mutually enhanced security with a Russia that will not accept dependency or subordination. Russia’s leadership is determined to protect and ensure the country’s sovereignty and place as a major international actor. The United States’ pursuit of the goal of missile defense cooperation will help ensure greater security for the American people and U.S. allies. The aim is not to assuage Moscow’s fears about hostile U.S. intentions or to enhance or appease President Vladimir Putin and colleagues in the Kremlin who question cooperation with America. U.S.-Russian cooperation on missile defense in Europe could lead to greater understanding between the United States and China regarding U.S. missile defense deployments in the Asia-Pacific region. It is essential to take advantage of the remaining window of opportunity to design and deploy an effective missile defense in Europe. At the same time, the United States and Russia must work to establish fundamentally new patterns of cooperation between East and West that can unlock the vast potential of an integrated Euro-Atlantic security community. A strategically sound initiative to build cooperative missile defense can be the catalyst for redefining U.S.-Russian security relations. Cooperative missile defense holds the key to a core element in any rebalanced twenty-first-century American geostrategic position. By making headway in this area, the United States will avoid antagonizing Russia, a country geopolitically vital to Europe and important to America, and will strengthen U.S. alliances with Europe in the process. Such cooperation holds the promise of further progress on the reduction of Cold War nuclear arsenals and will strengthen the hand of all seeking to curb further proliferation of nuclear weapons, paving the way for mutually enhanced security for all in the Euro-Atlantic region. The reset was a complete waste of time. Russia is not an ally and working on missile defense seems crazy. Reset was not waste of time, but carefully crafted strategy by US administration to improve bilateral reations beetween US and Russia. Russia is a strong and powerfull country with lot of pontential for economic growght in future. It is in US strategic interest to bring Russia closer to Europe and closer to Euro-Atlantic spehere of interest. You cannot take Russia to it's knees and exploit it on colonial style principle (as 18th and 19th century Africa by Europeans). This simply doesn't work with Russia ! Russia is to powerfull ! If you want to gain profit in Russia you have to invest and produce resoults in Russia. It has to be win-win strategy (for you and for Russia) ! Rich, prosperous and developed Russia is in our common interest. This is in interest of our capital, corporations and our bussines ! Prosperous Russia is the wind of oportunity for Euro-Atlantic economy ! Carnegie experts analyze the most pressing challenges and most promising opportunities awaiting President Obama in his second term.